extremely beautiful, (on request:) with fresh explicit crust , interesting chondrules! 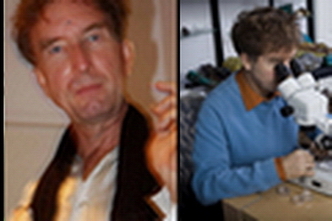 Analysis: Dr. Ansgar Greshake, Humboldt Univ; Berlin. 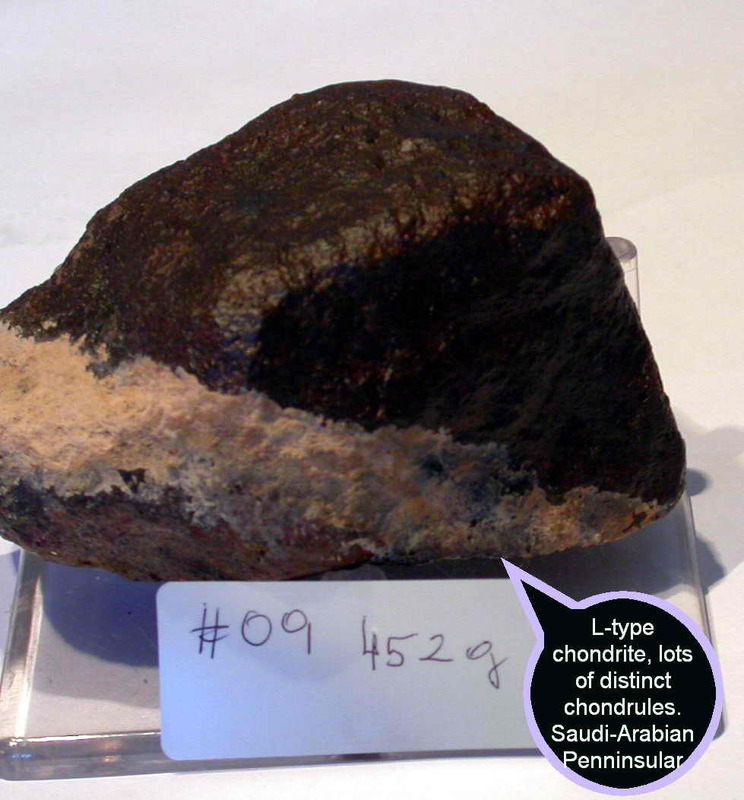 Chondrite , many pieces of total 500kg were found 2000 in the desert. 39.1g: Münster, Inst. Planet. Univ. H4/5 - DaG 869, very low shocked and fresh! Germany), J.N.Grossman, Met. Bull. 82, MAPS, 1998, 33, p.A221. 20g: Moscow, Vernadsky Inst. Geochem. recovered soon after the fall. One small complete meteorite was found 2002 in the Dhofar region on the Saudi Arabian Penninsular. several stones of TW 448gr were found on 27.12.1997 in a sand desert Al Jufra by anonymus finder. Fa 19,3; Fs 17,5, W3. 33.6g: Münster, Inst. Planet. Univ. individuals with explicit chondrules rich in contrast and of fresh quality in all sizes - ask! Found 2000 on the surface of the desert, total mass 4472 g: 7 pieces. Superb Stony meteorite individuals containing extraterrestrial water in halite (NaCl)! The pieces look outside quite similar to those from Juancheng but since it is low on iron content they are very light and such you get really a nice big meteorite with little weight for little money ! 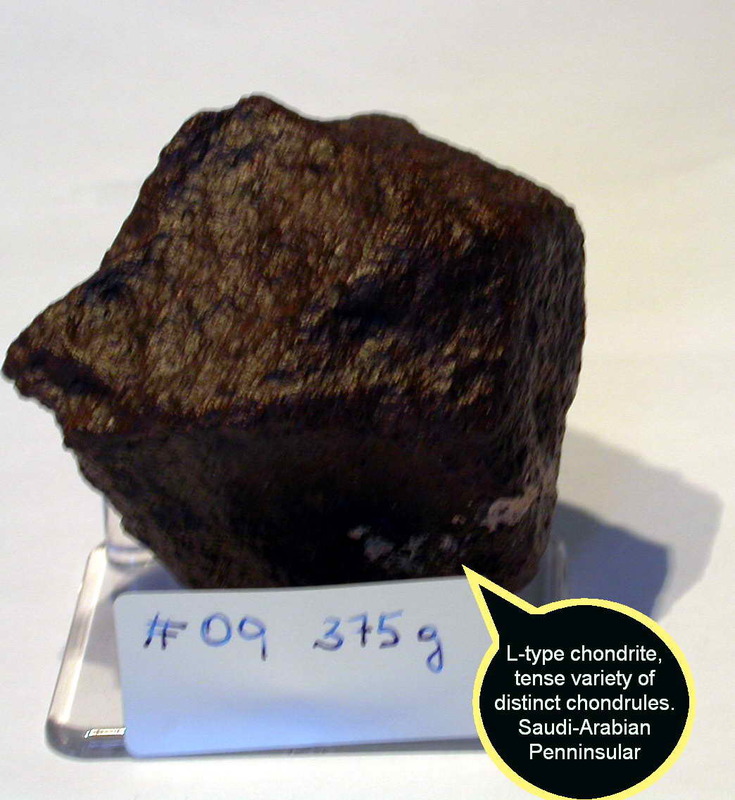 L-type chondrite, full of chondrules. 33.0g: Münster, Inst. Planet. Univ. This meteorite strewnfield was first discovered in 1954 in Ghubara, Jiddat Al Hirasis, gefunden: 2000 Arabian peninsular. Klassifikation: (L5) chondrite, xenolithic (meaning it has several mixed lithologies) and brecciated. almost perfect (84-99% crust) Individuals in nice shape !! all Individuals are from 7-20g and measure appr. from 1/2 x 1 inch to 13/4 x 2 inches . Note : These are unbroken Fragments! Price:: $11 -$ 32 / piece ! Let us know your wishes! shock stage S3; weathering grade W3. Key classification information: Fa of olivine is 30.5 (mol %), Fs of pyroxene is 25.5 (mol %). One weathered stone of total mass 150 g was found on the surface on 5th of Dec.1999 in the desert.. Nature of recovery site: rocky planes with carbonate stones, low areas covered with quarz-carbonate sand owergrown by low small bushes. A single stone of 414 g was found 2000, January 21 on the surface of the desert. 60 more different Ordinary chondrites of all types from DaG - all Classified with Met.Soc.Nr! All small meteorites come individually in a decorative display box! As always, we have much more to offer than we are able to show you here now. Kindly email us your wishes to determine if the items you want can be prepared especially for your wishes.